Love the Dioramas, can't wait to revisit this site and see what else you all have done! I love your website! I found your link off of Playmofriends. Take a look at the link. It's for a stop-motion movie I have been working on. http://www.youtube.com/watch?v=Wa5bx1oe8oI Enjoy! Dear Tahra, I've never looked into your still beautiful site....I loved the photos of those production errors and now will appreciate them more! This is a very good collection based site. Hello, I'm a huge playmobil fan and I LOVE the knights theme. i also really love the viking, pirates,and jungle themes, and if you know where to buy older, discontinued sets it would be very nice if you could inform me by e-mail. I love the fire theme! Love the site! I played with Playmobil when I was a little girl and loved it. I just wanted to let you know that I discovered a great site where you can purchase Playmbobil pieces and parts individually to complete your set or to use to customize. The store is called Ron's Rescued Treasures. Keep up the good work! I have been collecting Playmobil since my first set in 1978. This site is FANtastic. I was thinking of trying to have a North American collectors convention in Chicago. Do you think there is enough people to make it happen? Just wondering. Keep up the great work. hello playmo-adict. 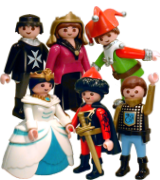 My name is Toyclick and I Webmaster to Toyclicks.net new for of playmobil in Spain. This website is amazing! very usefull and cool! i love the site, especially the museum.i am the webmaster of playmoworld,where playmobil run free and unchallenged!!!!!! Thank you for all your hard work in sharing your love of Playmobil with us. My klicky wishes include a Japanese samurai theme and an ancient Egyptian theme. I am 32 and since i remeber my self, i had playmobils. Although i do no play anymore, i collect them and i love them. It is sure that i will learn my two kids to love playmo's too. Bye! Congratulations!It was very nice to see and read the page-especially the medieval town, which is REALLY fantastique! Ive got 386 playmobile figures now and counting. A friend sent me a link to this site. beautiful playmobils in your site!!! your sight is awsom i got hooked on playmobile when i was 3 and still love it 12 years latter! keep it comeing!! I am still at a loss for words for the loss of this fine man had become and the actor was. I was interested in trading for things. PLAYMOBIL ROX SOX! I'm 12 (about to be 13) and my sister is 10, we have played with playmobil as long as I can remember. There's just something about those little guys that makes you addicted! Anyways, great site! Favorite Theme: Victorian, Pirates, Knights & KEYCHAINS!!!! Lovely site! I love it, with nice sections, and excellent links. It would be nice to meet to all the court :D See you guys!!! I love playmobil and I play it every day. I am currently planning a photo story which I will then make. I love the dinosaur set (even though I don't have it yet) and when I do get it, I will have such fun-just because it's the wonderful world of PLAYMOBIL! Queria contactar coleccionadores portugueses para possiveis trocas e partilha de informação! I love your city! I would be willing to purchase or trade for 3409 city defence, 3487 water, well, and food, 3627 merry men feast 3628 hunting party. I am also looking for cups, plates, mugs, pails, kegs, or any type of tables and benches. I really love this site, but English is not my mother lanuage so it is hard too read especially because you use a lettertype that is very difficult to read, but I really love how you put it all together. i think ordenberg is simply amazing! hurrah! I was thrilled to find this wonderful site! Amazed by the creativity of Countess Krystal's cards and stories! Wowed by talentd Tahra. Smitten by de customs and wit deWarrens! And "proud" to see my very own avatar in a simply perfect new ecard! You all are the very best. I tip my hooties...er...hat to Playkingdoms! Hi there! I do really like this site. I am collecting the circus theme "Romani". If any knows things about it or sites where I can buy things from the circus theme, please mail me at eriko90@msn.com Thank you! Wonderful !!!! All my life !!! Favorite Theme: Mostly Victorian, but also Magic, and many others. I LIKE VERY MUCH THE SITE, SPECIALLY THE MUSEUM, CONGRATULATIONS!!! Wonderful site !!! Congratulations !!! HAPPY NEW YEAR , FRIENDS !!! Congratulations!! !Happy Birthday for your site !!! I love it !!! Great site you have. beautifull picture's and a source of new idea's for new creations. keep up the good works. The game Laura is very beautifull I played it with my daughter on a me version off windows. We also played teh game Hype this is mre for boy but the graphics are very cool. Can yu telle me how I can get a Laura because we bought the game without a box. Greetings Bo and Sofie. Keep the magic alive. You guys make me proud. This is what toys and games should be like. Excelente concepção!! e umagrande supresa ser um site português! continuem! greetings to you wonderful folk behind this site. i've been smitten with the playmobil bug for about 6 months and now i find i am not alone. my kids think i have gone mad. love your photos. will send you some of mine when i get a camera. please do write. Oi! gostaria que alguém que tivesse playmobis para vender mesmo que só algumas peças entrasse em contacto comigo. Obrigado. / Hello! I would like that anyone that have playmobis or pieces to sell, please contact me. Thank you. can anyone tell me another playmobil site, for buy playmobil? only i wanted to let you know that i liked your website. At the same time i wanted to say congraulations for all the people who created this beautifull mock-ups!! And I want to know about new people around the world or for other countries!! Great site!! Thanks fer let us enjoy it. Keep it up the good work. This is a great page, im very impressed with the E-cards and the themes of course, i think are very funny, very unique!! Very very cool! Creative, informative, and fun, and funky! Look forward to seeing it grow. HOLA ESCRIBO DESDE ESPAÑA, ESPERO TENER CONTACO CON USTEDES. sABEN DE ALGUNA PAGINA DE PLAYMOBIL EN ESPAÑOL. GRACIAS. Does anybody know another e-mail address of Playmobil-Spain? Favorite Theme: Gosto de todos os temas! Muito legal essa página. Eu adoro os bonequinhos do Playmobil, já brinquei muito com eles quando pequena e até hoje ainda os tenho guardado! Favorite Theme: Gosto de todos os tema! I'm wonder if the shower gel still available?! it's sosososoosos cool!!! GREAT COLLECTION U HAVE! Félicitations ! Your website is wonderful and very interesting. I've learned a lot about playmobils ... my new hobby/passion ! I'll come back soon, your site is now in my recorded favorite sites !! Congratulation to the photographs ! I see the page and its very interesting. I´m a playmobil collector too (modest)and I have lots of famobil (spanish playmobil stuff... Its amazing see that the people is equal than you.Im obssesed too! congratulations for this webpage. I am looking for the very old accessories for the old castle figures --- like the yoke for carrying water. Fantastical,Special ,Wonderful !! !I love Playmocards !! !Congratulations !!! Your Site is Extraordinary !!! MERRY CHRISTMAS to all People of the World !!! www of spanish fans of playmobil? thank. Hi there! Cool site! I was just browsing for more playmobil lovers in the world. Since they brought out the Vikings, I am totally hooked to that world. Even made a film with the Vikings starring. If you like Playmobil, you're gonna love this! This is a wonderful site, congratulations. Favorite Theme: We enjoy the Victorian Doll House & Circus themes. My wife and I were introduced to Playmobil about two years ago. While on vacation we stopped at a toy store; that's where we saw our first Playmobil. For my wife it was love a first sight; the Victorian Doll House was coming home with her. At a later date I started to collect items for the Circus theme. A very interesting site! The changes in design on the new girl with the garden chair (3234) seem particularly suited to introducing Roman legionaries! Gostaria de informações de como adquirir peças para completar minha coleção. i love the playmobil !!!!!!!!!!! Location/Country: San Francisco, CA U.S.A.
Me gustaría felicitaros por esta magnífica página que habeis creado. Yo no se mucho de ordenadores, y menos aún de Inglés.Por eso, me gustaría que si alguien conoce alguna web en español, o quiera "hablar" de Playmobil en castellano, mi direccion es Albertoserralvo@hotmail.com. 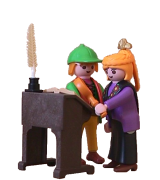 This is a very good site for all of friends of Playmobil. A question: do you know how can I contact with Playmobil Portugal? I had a problem with a set of eggs in Portugal and I don't know where I can ask them. Thanks. Favorite Theme: Playmobil - what so say more ;-) ? Great site! As Richard said, it's easy to navigate and quite complete. Keep up!